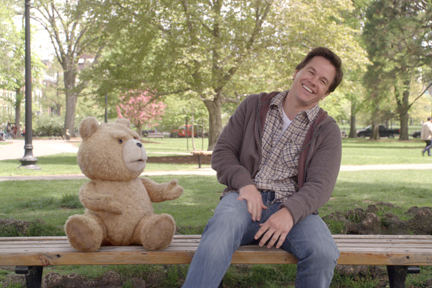 When John Bennett (Mark Wahlberg) was a little boy, he made a wish that Ted (Seth MacFarlane), his beloved teddy bear, would come alive. Thirty years later, foul-mouthed Ted is still Johns constant companion, much to the chagrin of Lori (Mila Kunis), Johns girlfriend. Though Loris displeasure is exacerbated by the pairs constant consumption of beer and weed, shes not the one whos most disappointed with John; it may take the intervention of Johns boyhood toy to help him grow up at last.